By Mark Smesko, Mike Vallas | March 1, 2017 at 12:05a.m. Happy Hour: Monday to Friday: 2 p.m. to 6 p.m.
A convenient location, delicious food, in a beautiful decor but yet it is barely on our culinary radar screen. Why is that? We both drive by this establishment every day. So is it due to familiarity or because we are idiots? Occam’s razor, and our friends, would suggest the latter. Nevertheless our second trip in 2017 brought us to Whitefire Grille in Canfield. On our visit, we met with Executive Chef Ryan Rygiel and Brian Jones, the general manager of Whitefire. Jones noted that Whitefire has been in operation for a little over three and a half years and has recently expanded operations by opening for lunch service during the week and brunch on Sunday. Chef Rygiel joined the restaurant about four months ago and has developed a chef-driven menu featuring weekly specials. Rather than trying to be a “destination” restaurant, his goal is to see Whitefire be an “everyday” restaurant, a place for the local community to count on for good food and good service. Our meal opened with a duo of appetizers, a crab cake and the signature New Zealand Lamb Lollipops. The first forks were to taste the Maryland style crab cake. Whitefire uses lump crab meat combined with lime and orange citrus, Old Bay seasoning, onion and diced red peppers. The cakes are flash fried and then baked off in the oven, giving it a crispy exterior while maintaining a creamy, savory filing. Served with a tasty pear and jalapeno slaw and Cajun remoulade, it’s a nice starter of contrasting flavors. Next were the lamb chops. Chef Rygiel uses New Zealand rib chops that get a 48-hour marinade in extra virgin olive oil, garlic and Italian seasonings. They are then grilled medium rare and served with Greek salad. The chops were seasoned perfectly, and the tomato, cucumber and feta salad was an excellent accompaniment. These were some of the best lamb chops we’ve had – nice char but not overcooked. These are highly recommended. We then sampled something off the specials menu, Cabernet Poached Pear Salad. The pears are poached in Cabernet wine until tender, then sliced thin. These sit atop a salad of arugula, candied almonds and gorgonzola cheese and dressed with a reduced pear liquid. The sweetness of the pears paired well with the peppery arugula and the sharp gorgonzola. A light, flavorful salad. Chef then explained he would be serving us four dishes from their featured entree menu. First up was their signature Filet Capone. He takes a “baseball” filet, which is the center portion of the beef tenderloin, seasons it simply with salt and pepper and cooks it to temperature. This is sliced and stacked with shavings of parmesan over a creamy tarragon risotto rimmed with a chocolate cabernet sauce. The dish was plated beautifully. When we first tasted the sauce alone, we weren’t quite sure what to make of it. When paired with the beef and risotto, it was magic. The beef was tender and seasoned nicely, the risotto was creamy but not overcooked and the sauce had a subtle chocolate flavor that just worked. This was a superb dish. Next appeared the Seafood Cioppino – chunks of cod, whole clams and mussels as well as shrimp cooked in a light clam-based broth with tomatoes served over linguini. Chef keeps the broth light and clean and lets the fresh seafood be the star of the dish. The pasta was al dente, and the broth was awesome. The crostini that were served with the dish were the perfect vehicle to sop up the liquid. A fantastic offering. The third entree was another seafood feature called Trout Gateau. Trout filets are wrapped around a crab meat filing and topped with smoked Gouda and a basil cream sauce. The dish included a micro-green salad and bright Achiote sauce, which illuminated the plate. The trout was light and flaky, the filling was creamy with a subtle flavor. The thing that made this dish was the smokiness from the cheese. This added some complexity to the dish and resulted in a delicious entree. Our last entree was a hearty serving of Whitefire’s Molten Lasagna. Layers of tender pasta with a Bolognese sauce made from beef, pork and veal. 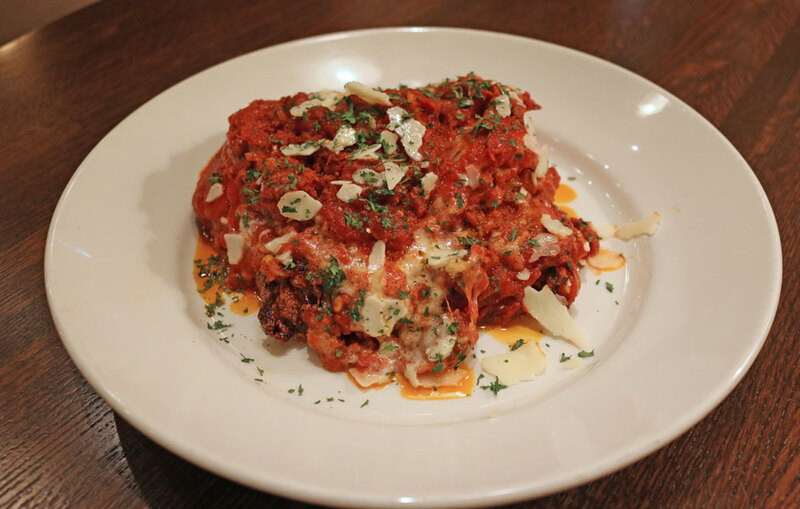 Chef uses both ricotta and mozzarella cheeses, as in any classic lasagna. The twist comes in where he uses a bechamel (white cream sauce) in the center of the dish. When you cut into this, it is a take on a molten dessert as the bechamel comes oozing out. The red sauce was tangy and was balanced by the cream sauce. A nice twist on classic Italian comfort food. Our meal concluded with an introduction to Whitefire’s pastry chef, Ashton McKendrick, and her signature dessert, Peanut Butter Pie. It was a sweet ending to a wonderful meal. If you’ve been driving by like us, it’s time to make a stop and taste the offerings in the comfort of the Whitefire.